5. 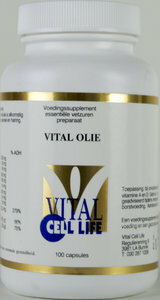 Vitamin D3 25 mcg..
Vital Oil - Fish-/Flax Seed -/Borage- /and Halibutliver oil. Fatty acid supplement. ADH = (European) Recommended daily intake for minimal health. In case of inadequate intake of Fatty acids from food or for additional intake, to provide the body whit extra fatty acids, gamma-linolenic acid, vitamin D and vitamin A. The product supports the formation of prostaglandins. This product is a dietary supplement and is not a substitute for a varied and balanced diet and / or healthy lifestyle.